In 1988 and most of 1989, Bobby Brown struggled to convince Australian audiences to join the new jack swing party that was sweeping the US and Europe. What a difference a few years make. This week in 1992, the R&B star shot straight into the ARIA top 10 with the lead single from third album Bobby, which quickly eclipsed even his previous biggest hit and went all the way to number 1. The song Bobby would eventually dethrone (and spend three weeks behind at number 2) was settling into its stay at number 1. This week in 1992, "Amigos Para Siempre (Friends For Life)" was on top for a second week. I haven't come across this British indie band before - the fact they never had a UK hit probably explains that. This was their first single for Rough Trade Records. She'd made a big impression with her debut single, but Gyan Evans hadn't been able to live up to "Wait" - a problem that continued with this lead release from second album Reddest Red. Song titles don't get much more country than this, do they? The latest single from This Road didn't fare anywhere near as well as the previous two. Meanwhile, a title like this could only belong to a Morrissey song. This was his second single in a row to make the top 100 - a rare run of continued (minor) success for him. The first of three songs that would've become breakers if that section still existed. This second single from Elton John's The One album was also included on the Lethal Weapon 3 soundtrack - Eric's second song from the movie. "One More TIme" proved one more single too many. This latest track from Hepfidelity became Diesel's first solo release to miss not only the top 50 but the top 20. Finally! This was the first Genesis single I liked since the Invisible Touch era - a pointed poke at all those money grubbing TV evangelists who'd been involved in recent scandals. 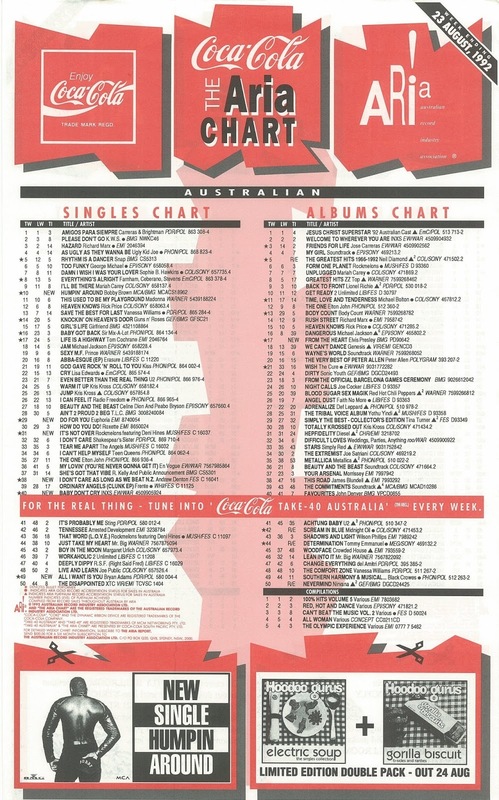 Diesel might not have been able to rack up a fifth hit from his number 1 album, but it seemed Australia's appetite for Bryan Adams singles was unabated as "All I Want Is You" became the fifth song from Waking Up The Neighbours to reach the top 40. Not issued as a single in North America, "All I Want Is You" was easily the most forgettable of the songs released so far and I have to wonder what would've happened if Australia had followed suit and skipped ahead to "Do I Have To Say The Words?" instead. Not even a 60-piece orchestra could help INXS's latest single from Welcome To Wherever You Are, with "Baby Don't Cry" becoming the first of a string of songs by the once chart-conquering band to peak in the 30s. Of course, the album was spending its second week at number 2 this week, but as I mentioned when "Heaven Sent" charted, Welcome To... would fall out of the albums top 50 in a matter of weeks. Yep, looks like INXS would have to make do with much smaller sales than they were used to. Just when you thought we'd seen all the Olympics-related songs to reach the top 50, this comedy record by the team from ABC sports panel show Live And Sweaty had a brief run on the chart. As the title indicates, the track played up the rivalry between Australia and New Zealand, but in the end, the competition wasn't that close, with the Aussie Olympics team finishing 10th on the medal table to NZ's 28th. The dream team of Rockmelons and Deni Hines continued their hit streak with this third collaboration giving them another top 20 hit. A glossy quiet storm-style ballad, "It's Not Over" is the type of song Australia had generally turned its nose up at in the late '80s and early '90s, but thanks to the success of "Ain't No Sunshine" and "That Word (L.O.V.E. )", it did just fine. Seems the combination of the pop/funk band and the soon-to-be solo star would not be bettered, with Rockmelons never returning to the top 40 after this again. Here's another Australian pop act that was on an impressive run. After two chart-topping singles, dance group Euphoria reached the top 10 for the third time with "Do For You" - although they didn't get there for another two months, finally peaking at number 7 the week before debut album Total Euphoria arrived on the chart in late October. Lead vocals on this even less club-oriented track were handled by group founder Andrew Klippel, with the music video very careful to differentiate between which backing and incidental vocals Keren Minshull and Holly Garnett each handled. Lesson learnt, then. It's a sign of how dramatically music tastes had changed in Australia in the previous couple of years that this first taste of Bobby Brown's third album, Bobby, would race into the ARIA top 10 when it had taken him several singles and the slow-climbing "Every Little Step" to reach that high in late 1989. But rap and R&B hits were commonplace now, and since Bobby was one of the more established artists of the genres, his first new music in four years was eagerly snapped up. 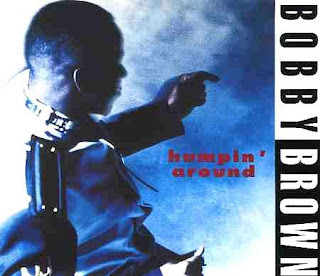 Of course, matters weren't hurt by the fact that he returned with a song called "Humpin' Around". Once again co-written and co-produced by LA Reid and Babyface (and associates), the track was, despite its promiscuous sounding title, a plea to a girlfriend for trust: "Ain't nobody humpin' around". All in all, a sentiment that was pretty appropriate for the newly wed singer, who'd married Whitney Houston in July and recorded a duet with her for Bobby. Next week: 1992's highest-selling single debuts - and it's worse than the Olympics duet! Plus, a children's TV favourite gets the rave treatment. Somehow I wish Gyan had had more chart success. "Wait" should've gone higher than number 14! I always thought it was "EVERYBODY humpin' around". Not that I listened too carefully to the lyrics, mind you. Legend. Anyone who can confirm Denton wrote this, please do & help restore my sanity!! 'Something's Gotta Give' should have done much better. Gyan deserved more than being a virtual one-hit wonder. I've seen the song title before, but don't think I've actually heard 'You're the One For Me, Fatty' until now. Lyrically, it's an interesting variation from the typical love song. I love the humour in the video, where 'fatty' is portrayed as constantly eating, and even eats a flower. I've uploaded the original, un-sanitised (I assume) for the US market 'Jesus He Knows Me' video here - https://vimeo.com/193480081 , containing the dialogue of televangelist Phil, plus the removed footage of Mike being papped with "the man he met last night" and more shots of the bikini-clad women in the pool with Phil. Pretty sure I haven't heard the Bryan Adams track since '92. Rhyming "insurance" with "insurance" in the second verse was stupid. It sounds like there could have been a hybrid Def Leppard/Bryan Adams album at this time; this song even has "you and me babe" sung much the same way as in Def Leppard's 'Rocket'. 'Do I Have To Say the Words?' was much better. I found 'Baby Don't Cry' quite irritating. The #30 peak was generous. The Andrew Denton video you've embedded has only just over half of the song. I had most of the video on a now-defunct youtube channel in 2008, but it looks like someone else has uploaded it. Deni's image was quite different for the Rockmelons stuff vs. her solo career, and I preferred the former. 'Do For You' really is quite bad vocally and image-wise. I'm surprised it eventually reached the top 10. Smash Hits reviewed the song as "I Could Do For You" some weeks before it was released. Speaking of bad, 'Humpin' Around' was pretty awful IMO, and seems quite forgotten for a #1 song now. 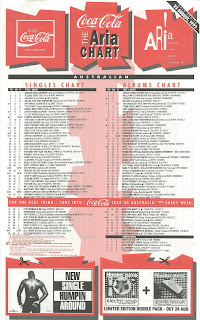 I'd say that 'Every Little Step' is remembered more in Australia, and this only got to #1 because of the title. I'm pretty sure "Do For You" only charted that well because of "Baby I Want It" with Young MC on the B-side. Everyone I knew preferred that song and I remember hearing it quite a lot at the time, much more so than the A-side.